Since Microsoft is preparing for the final release of Windows 10 on July 29th, the company didn’t deliver any major feature updates in its recent builds. But, when we discovered unofficial, leaked Build 10135, we noticed that there actually are some feature updates, and one of them is updated Snipping Tool. Snipping tool is actually a small, tiny feature that has been present since Windows Vista. But, a lot of users never used this tool and probably that is the reason why it didn’t have any updates since its introduction. But suddenly, while I was looking for the new features of leaked Build 10135 on the internet, I noticed that Microsoft decided to update this small, pre-installed Windows tool after so many years. The main change of the Snipping Tool is the introduction of Delay option, which allows you to delay taking of screenshots for up to five seconds. And this seems to be the only update of the Snipping Tool. But Snipping Tool is a small feature itself, so introducing of only one small change is not surprising. Microsoft’s decision to even update this program in first place is actually surprising. Why? Because it is well known that Microsoft is trying to switch from desktop apps to Universal apps. 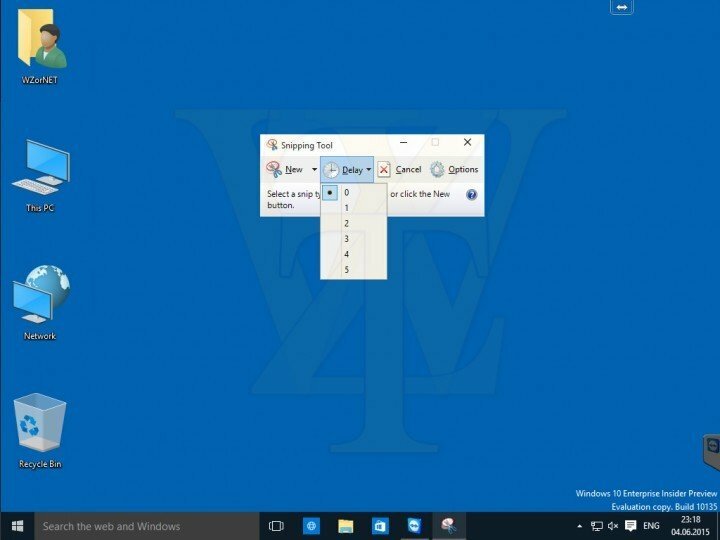 The fact that Microsoft created space for Universal apps in the new Start Menu proves this even more. So we’d rather expect an Universal version of the Snipping Tool, than update for the existing, desktop app. We don’t know if Microsoft will update other pre-installed tools in further builds or final version, like Sticky Notes, for example. But it won’t be a surprise if the company decides to ‘re-publish’ some of its tools as an Universal app. Would you like to see some Windows feature like Snipping Tool, Sticky Notes or Sound Recorder as an Universal app? Tell us in the comments.